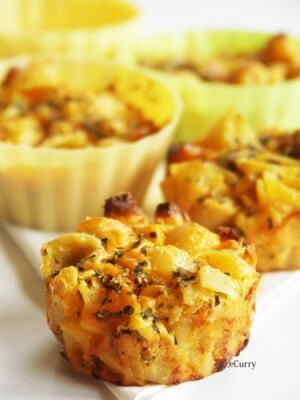 Chicken Cheese Cups recipe by Nazish Arslan at DesiRecipes.com. Boiled chicken pieces cut into small fine pieces. Salt ,black pepper according to taste. Samosa strips each cut into three equal squares(are available easily in market). this recipe needs a pastry baking tray with six or so cups in it. Cut each rectangular shape samosa strip in three equal squares. Now apply oil on the base of each pastry cup in a baking tray. Place one square of samosa on the other sqaure such that the angle of one comes right in the middle of one side of other. Keep applying oil between the samosa squares. Place three samosa squares on the top of each other such that it gives you a floral shape . Now mix rest all the ingredients . Put 1tbsp of this paste in each floral samosa cup . Put a drop of tomato sauce in the middle to beautify. Bake in the oven at 150 C for 20 mins. Keep checking with fork if the mixture has cooked and cup turn light golden . You can find these cups from any baking section of a super store. I just read it & its seem so good .. I ll surely gonna make it today :) Stay Blessed Nazish !! sounds very yummy. Going to try it tonight for iftaar. Will let you know how they turn out. very nice .I like it.